Castle Inn by Oki Doki i Warszawa, Polen: Bestill nå! 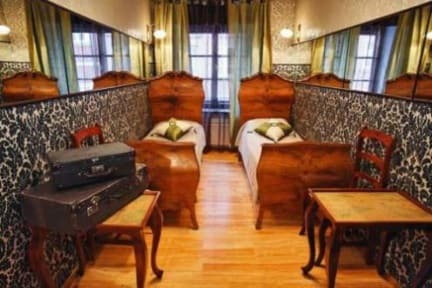 A dream of a hotel at the centre of Old Town you can expect big rooms, all with individual decor. The only boutique accommodation within the Warsaw Old Town with all of the hotel facilities, 10 meters from the Royal Castle. Stay, where all the things in Warsaw are going to happen. All the windows face The Castle Square or the Cathedral. When backpackers grow up, grow rich and can no longer stand hostels, they dream about places like this. Much like their clientele the owners of this place have also graduated up from hostels (We run the Oki-Doki hostel). If this is what becomes of hostels when they grow up, bring it on! Each room is different and most of them are created by our friend artists in different styles. Comfortable, incredible with the most of value added you can imagine. Plus affordable. Then we added the friendliness of our previously awarded, the most popular Warsaw property Oki Doki and the luxury of a 4 star hotel. Inside one of a few historical buildings which survived II World War. We offer 21 rooms en-suite, unforgettable view from every room on the beautiful square with its Column of the king Sigismond III. You will find international, friendly atmosphere.